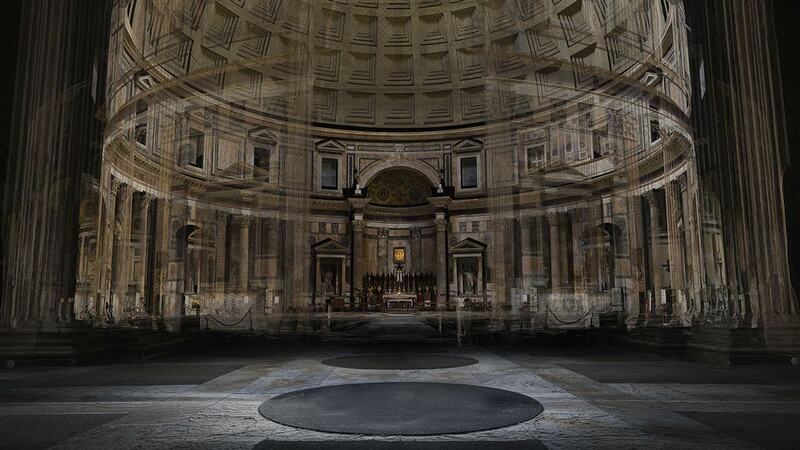 [Image: A laser scan of the Pantheon, courtesy ScanLAB Projects and the BBC; view larger!]. ScanLAB Projects, focus of a long article on Wired last month, are back in the news with a BBC documentary exploring the infrastructure of ancient Rome. We journeyed via the icy, crystal clear waters of subterranean aqueducts that feed the Trevi fountain and two thousand year old sewers which still function beneath the Roman Forum today, to decadent, labyrinthine catacombs. Our laser scans map these hidden treasures, revealing for the first time the complex network of tunnels, chambers and passageways without which Rome could not have survived as a city of a million people. The results, as usual, are both breathtaking and bizarre. [Image: Courtesy ScanLAB Projects and the BBC]. The surface of the city is scraped away, a kind of archaeological dermabrasion, to reveal sprawling networks of knotted masonry and old corridors spliced together in a translucent labyrinth less below than somehow in the city. One of the most interesting points made in Mary-Ann Ray’s excellent Pamphlet Architecture installment—1997’s Seven Partly Underground Rooms and Buildings for Water, Ice, and Midgets—is when she describes her use of composite photography as a way to experiment with new forms of archaeological documentation. Indeed, the pamphlet itself is as much architecture as it is archaeology—perhaps even suggesting a new series of historical site documents someone should produce called Pamphlet Archaeology—looking at wells, baths, cisterns, and spherical refrigeration chambers, in various states of ruin. 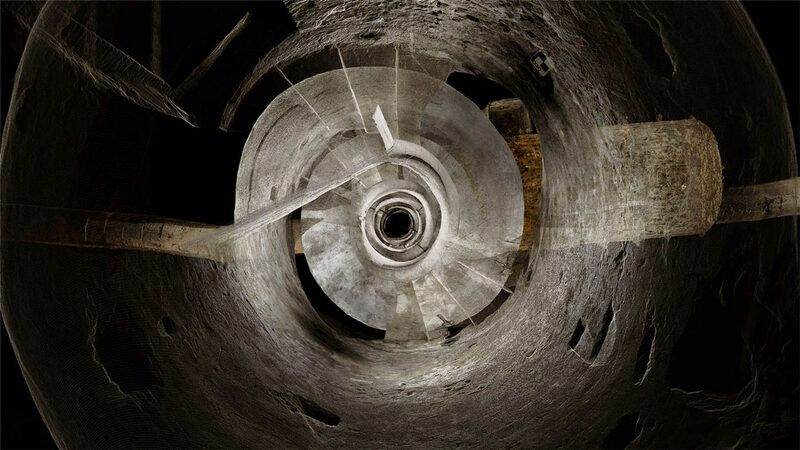 All of these are representationally difficult spaces, Ray explains, either curving away from the viewer in a manner that is nearly impossible to photograph or presenting constrictions of perspective that make even wide-angle photographs inadequate. What appears to be near is revealed to be far; what seems far away is suddenly adjacent. [Image: Courtesy ScanLAB Projects and the BBC; view larger!]. While Ray’s photographic approach is technologically, materially, and even visually very different from the work of ScanLAB, the two projects share a great deal, conceptually and methodologically. In fact, if many of the above quotations were applied, instead, to the images seen in the present post, they would seem to be the appropriate descriptions. [Image: In the ruined basements of architectural simultaneity; ScanLAB Projects and the BBC]. ScanLAB’s laser work seems to fulfill many of the promises of Ray’s composite photography, offering multiple, overlapping perspectives simultaneously whilst also eliminating the problem of the horizon or ground plane: you can thus look straight-on into the basement of an ancient structure without losing sight of the upper floors or chambers. The show airs tonight on the BBC. Check out ScanLAB’s website for more info, and definitely consider picking up a copy of Mary-Ann Ray’s book; it remains one of my favorites and has actually become more, not less, topical since its original publication. The London-based architectural group ScanLAB—founded by Matthew Shaw and William Trossell—has been doing some fascinating work with laser scanners. Here are three of their recent projects. [Images: From Scanning the Mist by ScanLAB]. In a way, I’m reminded of photographs by Alexey Titarenko. 2) Scanning an Artificial Weather System. For this project, ScanLAB wanted to “draw attention to the magical properties of weather events.” They thus installed a network of what they call “pressure vessels linked to an array of humidity tanks” in the middle of England’s Kielder Forest. [Image: From Slow Becoming Delightful by ScanLAB]. These “humidity tanks” then, at certain atmospherically appropriate moments, dispersed a fine mist, deploying an artificial cloud or fog bank into the woods. Then, of course, Shaw and Trossell laser-scanned it. Tools include the “stealth drill” which dissolves scan data in the surrounding area, creating voids and new openings in the scanned urban landscape, and “boundary miscommunication devices” which offset, relocate and invent spatial data such as paths, boundaries, tunnels and walls. The spatial and counter-spatial possibilities of this are extraordinary. Imagine whole new classes of architectural ornament (ornament as digital camouflage that scans in precise and strange ways), entirely new kinds of building facades (augmented reality meets LiDAR), and, of course, the creation of a kind of shadow-architecture, invisible to the naked eye, that only pops up on laser scanners at various points around the city. [Images: From Subverting the LiDAR Landscape by ScanLAB]. ScanLAB refers to this as “the deployment of flash architecture”—flash streets, flash statues, flash doors, instancing gates—like something from a short story by China Miéville. The narrative and/or cinematic possibilities of these “stealth objects” are seemingly limitless, let alone their architectural or ornamental use. Imagine stealth statuary dotting the streetscape, for instance, or other anomalous spatial entities that become an accepted part of the urban fabric. They exist only as representational effects on the technologies through which we view the landscape—but they eventually become landmarks, nonetheless. Here is one such “stealth object,” pictured below, designed to be “undetected” by laser-scanning equipment. Of course, it is not hard to imagine the military being interested in this research, creating stealth body armor, stealth ground vehicles, even stealth forward-operating bases, all of which would be geometrically invisible to radar and/or scanning equipment. In fact, one could easily imagine a kind of weapon with no moving parts, consisting entirely of radar- and LiDAR-jamming geometries; you would thus simply plant this thing, like some sort of medieval totem pole, in the streets of Mogadishu—or ring hundreds of them in a necklace around Washington D.C.—thus precluding enemy attempts to visualize your movements. [Images: A hypothetical “stealth object,” resistant to laser-scanning, by ScanLAB]. Briefly, ScanLAB’s “stealth object” reminds me of an idea bandied about by the U.S. Department of Energy, suggesting that future nuclear-waste entombment sites should be liberally peppered with misleading “radar reflectors” buried in the surface of the earth. The D.O.E.’s “trihedral” objects would produce “distinctive anomalous magnetic and radar-reflective signatures” for anyone using ground-scanning equipment above. In other words, they would create deliberate false clues, leading potential future excavators to think that they were digging in the wrong place. They would “subvert” the scanning process. In any case, read more at ScanLAB’s website.